Akashi-Kaikyo Bridge, completed in 1998, is still the world’s longest suspension bridge with a central span of 1991 m and total length of 3991 m. The largest challenge in its design was to seek an aerodynamically stable girder section and, for this purpose, a fairly large number of wind tunnel model tests were conducted. After the completion of the bridge, a long-term monitoring system was installed to measure bridge performance under wind and seismic actions. The system, consisting of numerous sensors such as velocity meters, GPS (Global Positioning System), and anemometers, was placed on the bridge pylons, piers, and girder. Based on 20 years of measurement, wind-induced lateral deflections of the girder during typhoons were recorded successfully by GPS and compared with the values used in design. It was found that the design had very accurately predicted the 10-min average values, whereas it slightly overestimated the 10-min maximum values. This example demonstrates the real value of long-term monitoring. The long-term monitoring results could confirm the safety reserve of the wind-resistant design code used for long-span bridges in Japan. Vibration-based monitoring of large civil structures such as the Akashi-Kaikyo bridge and many other important flexible bridges and buildings is essential to ensure that built civil structures satisfy their design requirements and assumptions. Vibration-based monitoring is also important to examine the condition of actual structures to ensure their high durability and long service life. The developments on vibration-based monitoring for the performance evaluation of flexible civil structures in Japan are comprehensively described in this issue (pp. 98-128). 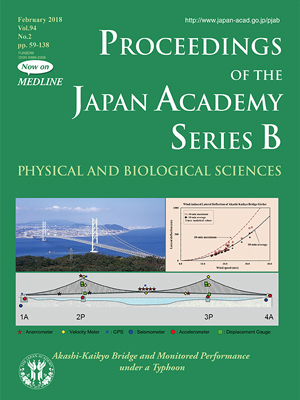 Yozo Fujino, the author of the paper, has been involved in the analysis of a range of vibration monitoring data to understand the real performance of large bridges and buildings under real actions such as strong winds and earthquakes. Through the findings of more advanced information on the dynamic behavior and the confirmation of the validity of the design practices in the various structural monitoring case studies, he has made a great contribution in vibration-based monitoring and is considered to be one of the international leaders in structural health monitoring.